One useful skill in CS is presentation of technical material to peers and/or superiors. Novices, however, often come to computing as introverts for whom public speaking is difficult and even frightening. I want my students to become better speakers, especially in presenting their own work since it is often the loudest speaker who is heard, not necessarily the one with the best ideas. How do we make a safe and comfortable environment for novices to learn to present their work to their classmates? One of the aspects of this, of course, is to learn to accept feedback from the listeners and to evaluate it properly. In a class of novices this may also require some training of the listeners so that they offer constructive advice and not just negative comments. It may also require finding ways to quiet those who offer inappropriate feedback, but to also teach them better behavior. The goal is to give the students practice so that they become more comfortable with doing this. You can not expect them to just one day, stand up in front of the class. You need to prepare them for it. Encourage students to take risks. Give permission to make mistakes, but not just permission, make it a goal. I tell them that computer programming (and learning) is about making mistakes. In a one hour lesson, if you only make 100 mistakes, then you are not working hard enough. Get them making mistakes, get them celebrating mistakes. One way to celebrate errors, is «test first»: Write test; run test, test fails, celebrate; write code; run test, test passes (maybe); repeat. So how Austin improved his drawing: He got feedback from the class after each drawing, and used this feedback to make a better drawing. 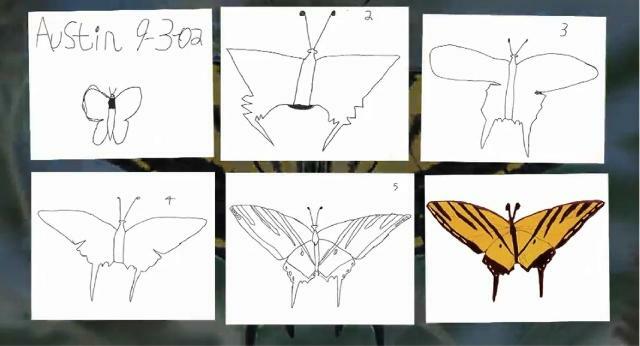 It took six attempts before he drew the final image. believe that mistakes are an indication that they are learning. believe that they are in top set because they work hard. believe that mistakes are an indication that they are stupid. believe that they are in bottom set because they are stupid. like easy work, that they can get correct. Or very hard work that gives them an excuse. Get them helping out with the class. Build a culture of helping / talking-to each other. I want my students to become better speakers, especially in presenting their own work since it is often the loudest speaker who is heard, not necessarily the one with the best ideas. I don't quite see the logical connection here. Becoming better speakers won't make them louder speakers, and the louder speakers will continue to be heard more even if they're terrible at actually speaking. In a class of novices this may also require some training of the listeners so that they offer constructive advice and not just negative comments. There's no "may" about it. With brief training they will be able to offer positive comments as well as negative ones, but to give constructive advice they need to know what they're talking about. For example, anyone can tell you "I couldn't follow the thread", but to suggest specific structural changes you need to know the broad types of structure which could have been used. There are various organisations which are dedicated to training in public speaking: Dale Carnegie and Toastmasters being perhaps the best known. (Disclaimer: I'm a member of Toastmasters and have previously held various offices in my local club, so I'm not unbiased). You could look at their approaches, and if you have a branch of such an organisation in your city (or even in your school/university) you could see whether they'd be interested in helping out. Speaking from the Toastmasters perspective, there are one or two projects which people on the leadership track can complete by running a training session with a recruitment plug: you may or may not consider that appropriate for your setting. In addition, particularly if there's a club in your school/university, you might be able to get a couple of members to come along to a lesson on the basis that one of them gives a speech for evaluation, your students offer their feedback, and then the other gives an evaluation which confirms or corrects the students' feedback. (If necessary, explain that the rules allow one project in five to be done outside club meetings provided that another member is present and gives a written evaluation. I haven't seen this option used much, so the members of your local club might not be aware of it). The good thing about this is that someone who's done a few projects in Toastmasters will be used to being evaluated by people with differing levels of experience, and being a volunteer will find it less stressful than your students. That way they can learn to give feedback without destroying their peers' confidence. The second visitor will also (I hope!) demonstrate how to give suggestions for improvement sandwiched between affirmation of positive observations in order to (quoting the title of the manual) "evaluate to motivate". Since you probably won't have volunteers to come to every lesson for several weeks in a row, this might be best saved as a final practice before getting into real peer evaluation. You could build up to it with a series of lessons in which you teach a specific skill (speech structure, body language, word choice and sentence structure, visual aids, ...), watch a video (maybe a talk from TED, Ignite, or something similar), and then ask the class to give feedback. Here's a personal story. It's about various art schools not CS, but the situation is similar, I believe. While in high-school, I also studied in art school. The teacher in the art school was a renowned professional, I believe he even had some awards from the ministry of education (we are talking about socialist style education). As part of our activities in the art school we were supposed to learn to talk about what we were drawing. (Artists are also expected to produce statements...) The unfortunate reality of the trade is that the bizarre blabbering of the artist about her work is what makes all the difference, not the quality of the said work. In an effort to teach us to do this, the teacher required us to start with something like bringing a stool in the middle of the classroom, standing on it and announcing own name and some other personal details, like hobbies etc. Some kids in the class seemed to enjoy the activity. I wholeheartedly hated it. I thought it was stupid and pointless. I also believed that people should judge artists' work on its own merits, and that using words to describe an art piece is by definition worthless, because would it be possible to use words to describe images, why go to such length as to create those images in the first place? This practice was novel and quite in contradiction to the education system which emphasized modesty and objectivity, thus seeing such attempts at entrepreneurship as outright evil. I went to college first in the post-socialist country, then in a country which had no such past, and was basically copying all of its education system from the States. Now commenting on peers' work was a requirement rather than some extravagant way to spend time in the classroom. However, what I also learned was that peer criticism was anything but objective. In fact, social dynamics in a classroom would distort the feedback so much, that it would be much worse than no feedback at all. Regardless of the quality of their work, prettier girls would get much better feedback than boys with unremarkable appearance. Students who previously received positive feedback from a peer would feel socially obligated to repay the favor. Some people learned to exploit this simple behavior more than others... Not to mention that typically, there were a handful of bright students per classroom, who would either deservedly steal the show from the rest, or would be in opposition, and thus get no (useful) feedback what so ever. For long time I believed that peer criticism was just a bad practice created by people who never cared to verify how well it actually works / the problems it creates. However, as an adult, I went to school once again, now to study CS. Here, the situation changed: the amount of work a student is supposed to produce and the difficulty of communicating the results of the research is such that it certainly justifies a brief oral introduction. It doesn't feel stupid and the social pressure, while still there, faded into background since it no longer has this strong influence on the reception of your work. I strongly believe that public presentation is only warranted when the amount of work to be presented is so vast that a synopsis is indeed helpful. Subsequently, I don't believe in immediate feedback, and especially not one produced under peer pressure. Ideally, I'd have a seminar, where students present the results of their research / lab study, followed by an assignment of groups of students to study the results being presented, followed by another seminar where the "study groups" critique the works they were assigned to. One technique we use is to work and present in groups. We give them guidance that different members of the team have different strengths and they all do not need to present. Some of the team can research, some create the presentation material and some can present. Those who are not presenting do not have to leave their classroom seat. Alternatively the time can be divided and each can have a small number of minutes and they can share the presentations. This way the less confident can play their strengths. I am an advocate of students with special needs, and in my experience they are less uncommon in computing classes than one might imagine, particularly in higher education. (Big Bang Theory citation perhaps). One should also see the "Imitation Game" to note how Alan Turing was portrayed; certainly "on the spectrum" in my view. This means a class can have some shy and reserved students but also some at the more extreme end with more extreme or radical responses public speaking situations. Some may be diagnosed but, in my experience, many have not yet been diagnosed and have managed to hide in the crowd so far. We have some very social phobic students, and the method of starting with group presentations allows them to participate without triggering their fear factors. We also find they end up contributing a bit more than they expected by the time of the final assessment, and over a period of a three year degree programme we can find ways for them to overcome or work with their particular issues. One of the ways we might use to help them present is to have the more senior students make their own videos, which can just be screen captures with voiceover (but often much more). We also find this eases them into making good presentational material. They then present by playing part of their video and just adding minor interjections and perhaps answering questions instead of the full blown "stand-up and talk". In conclusion, I wanted to illustrate that extreme social phobia is not unknown in our subject and we should be prepared to cope with it with innovative and inclusive techniques. I am wary that these problems can be solved by a single teacher in a single class just getting the shy ones to be brave, so wanted to speak up! Not the answer you're looking for? Browse other questions tagged best-practice student-motivation classroom-management or ask your own question.